Want to get rid of acne and acne scars the natural way? Tea tree oil naturally disinfects and soothes the skin without stripping it of its natural oils. It acts similarly to benzoyl peroxide without drying and damaging your skin. This natural oil can even prevent the occurrence of acne in the long run. 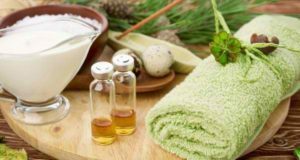 Read this guide to learn how to use tea tree oil for acne and acne scars. 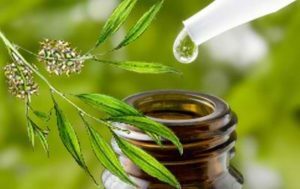 Tea tree oil, also known as melaleuca oil, is an oil that is pale yellow to nearly colorless. It is extracted from a tree native to Australia and is a popular treatment for many skin ailments. Its natural antifungal and antibacterial properties make it a popular addition to creams, face washes, and lotions. Acne is a common skin problem caused by clogging of pores due to excess production of sebum. In addition, bacteria cause acne breakouts. Tea tree oil has antimicrobial compounds that act effectively against bacteria that cause these breakouts. Similarly, this essential oil penetrates into the skin and unblocks pores and sebaceous glands to disinfect them and reduce acne. Tea tree oil also works as a natural solvent. It removes grease and dirt while protecting the skin from oxidative stress. In short, tea tree oil is: antibacterial, antiviral, antiseptic, and antifungal. Given these properties, it is no wonder that this essential oil is great for acne and acne scars! According to Dr. Axe, tea tree oil is one of the best essential oils for acne and acne scars. It contains terpenes that destroy bacteria while offering soothing qualities. In addition, a study conducted in Australia reveals that using tea tree oil gel improves mild to moderate acne as compared to using regular face wash. Another study conducted in University of Maryland Medical Center also shows that this natural essential oil treats acne just as effectively as benzoyl peroxide with fewer side effects. 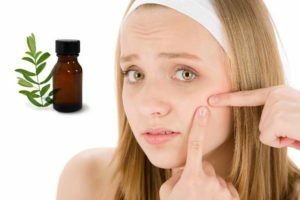 You can apply tea tree oil directly to pimples. Just put a few drops on a cotton pad and dab on your face. Note: If it’s more than 15% tea tree oil, dilute with water. You can also mix tea tree oil and aloe vera or organic honey for a milder spot treatment. Aloe vera and honey are also great for the skin. Furthermore, you can store these concoctions in a small lip gloss container for easy application. You can add tea tree oil to your DIY or store-bought face mask to treat acne. One way to make your own tea tree oil face mask is by mixing 4 drops of tea tree oil to green clay powder that you can buy at most health food stores. Just add enough water to turn it into a paste and apply on your face and neck. Leave it for 20 minutes. Afterward, you can rinse off with warm water and pat dry. Similarly, you can use ¼ cup of plain yogurt and 5 drops of tea tree oil as a mask. Leave for 20 minutes and rinse with warm water. Massage the mixture onto damp face in circular motion for 2 minutes, wash off with water, and pat dry. Note: This is perfect for people with mild to medium breakouts; however, it may be a little rough for people with cystic acne. Add a few drops of this natural oil to your daily cleanser and moisturizer to fight pimples. A couple of drops of tea tree oil to your bath will help clear acne on your back and chest. You can purchase tea tree moisturizers, cleansers, and spot gels online. Below are some of my recommended brands. What I like about it: This 100% pure therapeutic grade oil is the #1 bestseller in Amazon for its category – and for a good reason. It is unfiltered and undiluted with no additives or fillers. You can easily mix it with carrier oils such as coconut oil for a milder acne treatment. This great natural oil has effective detoxifying and cleansing with anti-fungal properties. Aside from acne, it also treats and removes skin tags, nail fungus, and other skin disorders. A great addition is that it smells great! 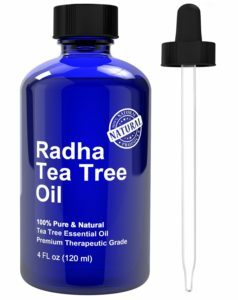 You can check some of the reviews about this tea tree oil on Amazon and see why it’s highly recommended. What I like about it: This tea tree oil is pharmaceutical grade and 100% steam distilled and undiluted for highest potency. It is made of highest standard and bottled in the USA in an FDA registered facility. 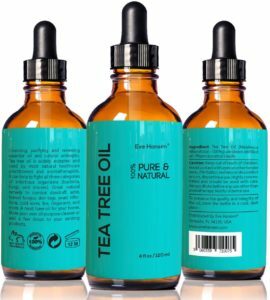 If you have been using tea tree oil for a while, you will love the bulk discounts provided by Eve Hansen for large bottles. If you are a first-time user, you can try this product risk-free because the company offers 100% money-back guarantee if you are not satisfied. What are you waiting for? Check it out now. What I like about it: This premium quality oil is 100% pure and natural. In fact, it is made with handpicked melaleuca alternifolia leaves that are steam distilled and packaged in the USA. In addition, the product comes with a glass dropper for ease of use. Amazon users have been using this product not only for its skin and health benefits but also as a general house cleaner. 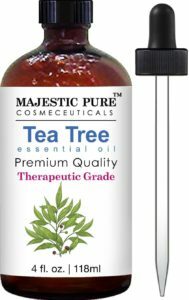 It is one of the best tea tree oil products I can recommend. People with sensitive skin must dilute tea tree oil with water or a carrier oil such as coconut oil before using. You can also mix tea tree oil with honey for an all-natural face mask. Apply tea tree oil to a clean face. Only use tea tree oil topically. It has severe side effects when swallowed. Always do a skin patch test before applying tea tree oil on your face.